The thirteenth dynasty of ancient Egypt (notated Dynasty XIII) is often combined with Dynasties XI, XII and XIV under the group title Middle Kingdom. Other writers separate it from these dynasties and join it to Dynasties XIV through XVII as part of the Second Intermediate Period. Dynasty XIII was from approximately 1773 BC to sometime after 1650 BC. The thirteenth dynasty is notable for the accession of the first formally recognized Semitic king, Khendjer. The thirteenth dynasty proved unable to hold onto the entire territory of Egypt, however, and the provincial ruling family in Xois, located in the marshes of the western delta, broke away from the central authority to form the fourteenth dynasty. The splintering of the land accelerated after the reign of the thirteenth dynasty king Sobekhotep IV. It was during the reign of Sobekhotep IV that the Hyksos may have made their first appearance, and around 1720 BC took control of the town of Avaris (the modern Tell ed-Dab'a/Khata'na), a few miles from Qantir. The outlines of the traditional account of the "invasion" of the land by the Hyksos is preserved in the Aegyptiaca of Manetho, an Egyptian priest who wrote in the time of Ptolemy II Philadelphus. Manetho recorded that it was during the reign of "Tutimaios" (who has been identified with Dedumose I of the Thirteenth Dynasty) that the Hyksos overran Egypt, led by Salitis, the founder of the fifteenth dynasty. This dynasty was succeeded by a group of Hyksos princes and chieftains, who ruled in the eastern delta region with their local Egyptian vassals and are known primarily by scarabs inscribed with their names and the period of their reign is called the sixteenth dynasty by modern Egyptologists. The later rulers of the thirteenth dynasty appear to be only ephemeral monarchs under the control of a powerful line of viziers, and indeed, it has been suggested that the ruler in this period might have been elected, if not appointed. One monarch late in the dynasty, Wahibre Ibiau, may have been a former vizier elevated to the office. Beginning with the reign of Sobekhotep IV, the power of this dynasty, weak to begin with, deteriorated. The later king Merneferre Ai (ruled c. 1690 BC) appears to have been a mere vassal of the Hyksos princes ruling there; his successors held onto their diminished office until sometime after 1650 BC. Around the time Memphis and Itj-tawy fell to the Hyksos, the native Egyptian ruling house in Thebes declared its independence from the vassal dynasty in Itj-tawy and set itself up as the seventeenth dynasty. This dynasty was to prove the salvation of Ancient Egypt and eventually would lead the war of liberation that drove the Hyksos back into Asia. The two last kings of this dynasty were Tao II the Brave and Kamose, who traditionally are credited with the final defeat of the Hyksos. With the eighteenth dynasty, the New Kingdom begins. In later texts, this dynasty is usually described as an era of chaos and disorder. However, the period may have been more peaceful than was once thought since the central government in Itj-tawy near the Faiyum was sustained during most of the dynasty and the country remained relatively stable. Unfortunately, the true chronology of this dynasty is difficult to determine as there are few monuments dating from the period. Many of the kings' names are only known from an odd fragmentary inscription or from scarabs. Sobekhotep II was an Egyptian king of the 13th Dynasty. He is known from several monuments, including a statue, several Nile level records in Nubia and from building works at Medamud and Luxor. The Nile level records provide a year date 'four', showing that he reigned at least three years. The Papyrus Boulaq 18 found in the tomb of the scribe of the great enclosure Neferhotep, is an administrative document of the Theban palace which dates to Sobekhotep II and names the 'king's wife' Aya, the vizier Ankhu and other officials. The Papyrus Boulaq 18 is an Ancient Egyptian document found in 1860 AD in the tomb of the scribe of the great enclosure Neferhotep. It is now in the Egyptian Museum in Cairo. It contains an account of the Theban palace dating to the 13th Dynasty (around 1750 BC). The papyrus lists the palace officials and the rations they received day by day. Important officials mentioned are, for example, the vizier Ankhu, but also the queen Aya. Therefore the document is of great historical importance. It also reports the journey of the king to the temple at Medamud and reports the arrival of a delegation of Nubians. The exact dating of the document is disputed. The name of the king is heavily destroyed. Formerly scholars identified the remains with Sobekhotep II. There is some dispute in Egyptology over the position of this king in the 13th Dynasty. 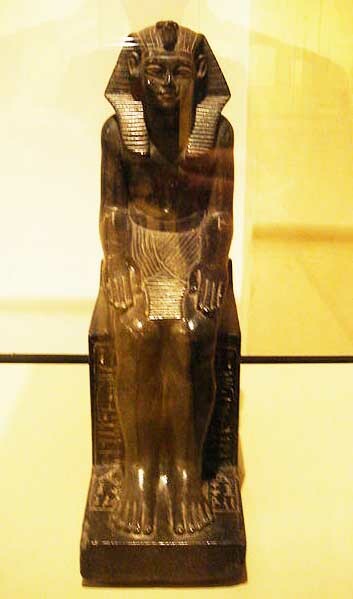 The throne name Sekhemre Khutawyre appears in the Turin King List as the 19th king of the 13th Dynasty. However, the Nile level records and his appearance on a papyrus found at Lahun indicate that he might date to the early 13th Dynasty. In both monument types so far only kings of the late 12th and early 13th Dynasty are mentioned. 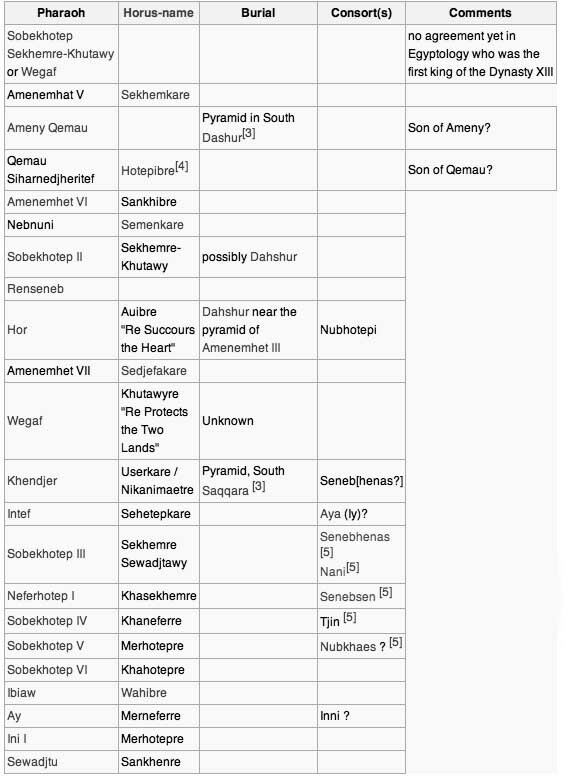 In the Turin King List appears as first king Khutawyre and it is therefore possible that the writer of the list confused Khutawyre with Sekhemre Khutawy (compare: Wegaf). Based on his name it has been suggested that Sobekhotep was a son of the last king of the 12th Dynasty, King Amenemhat IV. Sobekhotep may have been a brother of Sonbef, another ruler of the 13th Dynasty. Amenemhat V Sekhemkare was an Egyptian king of the 13th Dynasty. He appears as 'Sekhemkare' in the Turin King List. Contemporary monuments of this king are several Nile level records and a statue found at Elephantine. He reigned for a minimum of 3 years according to the Turin Kinglist. Ameny Qemau was an Ancient Egyptian king of the early Thirteenth Dynasty, probably the same person as Sehotepibre, who is known from the Turin King List. His position within the succession is uncertain. The Pyramid of Ameny Qemau, one of the pyramids in southern Dahshur has been identified as being constructed for him. HotepibRe (or Siharnedjheritef) was an Ancient Egyptian King of the Thirteenth dynasty of Egypt (Second Intermediate Period). Siharnedjheritef was likely the son of Ameny Qemau and the grandson of King Amenemhet V. He was possibly succeeded by a king named Jewefni who may have been a brother. After a short reign the throne went to another grandson of Amenemhet V named Amenemhet VI. For this king we have a statue dedicated to Ptah. The statue was found in Khatana, but the original location is not known. A Temple-block from el-Atawna is now in the Cairo Museum (Temp 25.4.22.3). Semenkare (birth name: Nebnun) was an Egyptian king (throne name: Semenkare) of the 13th Dynasty. "Semenkare" means "the one who establishes the Ka of Re". He appears in the Turin King List. He is only known from one contemporary object: a stela found at Gebel Zeit. He reigned most likely only for a very short time. Sobekhotep II was an Egyptian king of the 13th Dynasty. He is known from several monuments, including a statue, several Nile level records in Nubia and from building works at Medamud and Luxor. The Nile level records provide a year date 'four', showing that he reigned at least three years. In the Turin King List appears as first king Khutawyre and it is therefore possible that the writer of the list confused Khutawyre with Sekhemre Khutawy (compare: Wegaf). Based on his name it has been suggested that Sobekhotep was a son of the last king of the 12th Dynasty, King Amenemhat IV. Sobekhotep may have been a brother of Sonbef, another ruler of the 13th Dynasty. Renseneb or Ranisonb was an Egyptian king (throne name: so far unknown) of the 13th Dynasty. He appears in the Turin King List (Columne 7, line 16) with a reign of four months. He is only known from one contemporary object, a bead which shows that he had a double name: Renseneb Amenemhat. Egyptologist Kim Ryholt reads the double name as a filiation, 'Renseneb son of Amenemhat'. However, other researchers do not follow him in this interpretation. Hor was an Egyptian king of the 13th Dynasty. He appears in the Turin King List as Au-ib-Re. 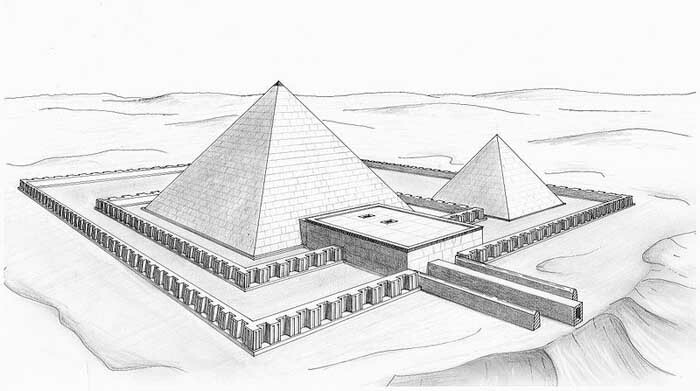 He most likely reigned only for a short time, not long enough to prepare a pyramid, which was in this dynasty still the common burial place for kings. Hor is mainly known from his burial in a shaft tomb found at Dahshur next to the pyramid of king Amenemhat III. The tomb was found essentially intact and still contained the partly gilded wooden coffin of the king, a naos with a statue, some jewelry, the canopic box with canopic vessels, two inscribed stelae and several other objects. Next to the burial of the king was found the undisturbed tomb of the 'king's daughter' Nubhetepti-khered. She was likely a daughter of King Hor or otherwise a daughter of Amenemhat III. As far as is known, Pharaoh Hor seems to have been an ephemeral ruler, not least because his reign seems to have been notably short. 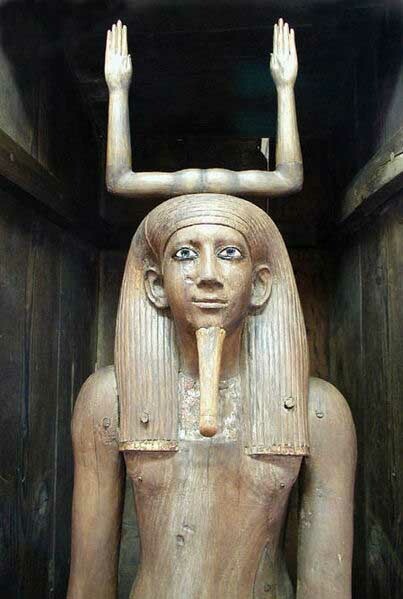 He nevertheless bequeathed to posterity one of the most frequently reproduced examples of Ancient Egyptian art: the photo shows the well-known wooden statue now in the Cairo Museum (CG259). This is one of the best-preserved and most accomplished wooden statues to survive from antiquity, and illustrates an artistic genre that must once have been common in Egyptian art, but has rarely survived in such good condition. Hor is believed to have had a reign of only seven months around the year 1760 BC. This short period corresponds very well to the archaeological remains, since he will not have had time to commission a substantial tomb. Sedjefakare Amenemhat was an Egyptian king of the 13th dynasty, known from the Turin King List, and several other objects, including six cylinder seals, one bark stand from Madamud and two scarab seals. His name appears as graffito in the tomb of queen Khuit at Saqqara. Ryholt assigns him without further evidence a reign of 6-7 years. Khutawyre Wegaf (or Ugaf) was an Egyptian king of the 13th Dynasty who is known from several sources, including a stelae and statues. There is a general known from a scarab with the same name (Wegaf) who is perhaps identical with this king. t Abydos, he made a stele dedicated to preserving the procession road in the area of Wepwawet, later usurped by Neferhotep I (Cairo Museum JE 35256). Khendjer was an Egyptian king (throne name: Userkare) of the 13th Dynasty. The name Khendjer is poorly attested in Egyptian. Khendjer was, therefore, the earliest known Semitic king of a native Egyptian dynasty. Khendjer's prenomen or throne name, Userkare, translates as "The Soul of Re is Powerful. The latest attested date for his reign is the fourth month of the season of Akhet (inundation), day 15 in his fifth regnal year. Kim Ryholt notes that two dated control notes on stone blocks from his unfinished pyramid complex give him a minimum reign of 4 years 3 months and 5 days. The aforementioned control notes are dated to Year 1 I Akhet day 10 and Year 5 IV Akhet day 15 of his reign. Khendjer is known primarily from his pyramid complex excavated by G. Jequier at Saqqara which was perhaps completed as a pyramidion was found. He is also known from several inscriptions and objects which bear his unique Semitic name. These include a fragment of a canopic jar found at his pyramid complex of Saqqara, which offers a partial name for his queen, Seneb ... "which may be restored as Sonb[henas]." A stela from Abydos records building projects by the king at the Osiris temple at Abydos and names the vizier Ankhu. Another stela once in Liverpool (destroyed in World War II), provides the name of the king's son "Khedjer". He might be a son of the king.Other objects with his name, according to the list provided by Ryholt, include three cylinder-seals from Athribis, a tile found near el-Lisht, scarab seals and an axe blade. 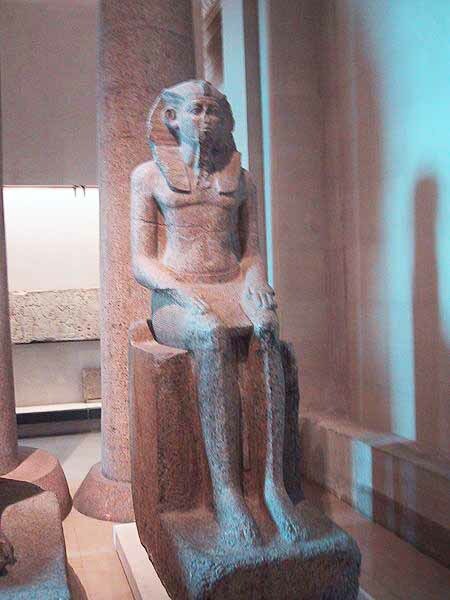 Sehetepkare Intef (alternatively Antef or Inyotef) was an Egyptian king of the 13th dynasty, known from the Turin King List, and a statue now in the Egyptian Museum in Cairo. He originally came from Medinet Madi. He reigned only for a short period. In the literature he is sometimes referred to as Intef IV  or Intef V. Queen Aya (Iy) may have been a wife of Sehetepkare Intef, but this is not certain and she may have been the wife of another 13th dynasty king. Sobekhotep III (throne name: Sekhemresewdjtawy) was an Egyptian king of the 13th dynasty. The family of the king is known from several sources. A monument from Sehel Island shows Sobekhotep with his father Mentuhotep, his mother was Iuhetibu (Yauheyebu), his brothers Seneb and Khakau, and a half-sister called Reniseneb. Reniseneb was a daughter of Iuhetibu and her second husband Dedusobek. Sobekhotep II had two wives, Senebhenas and Neni. A stela from Koptos (Qift), now in the Louvre (C 8), mentions the daughters of Neni: Iuhetibu (Fendy) and Dedetanuq. Iuhetibu Fendy wrote her name in a cartouche. This is a second time in Egyptian history that a king's daughter received this honor. Senebhenas is shown with Sobekhotep on an altar in Sehel Island and a stela in Wadi el-Hol. The stela depicts Sobekhotep III before the god Monthu. He receives an ankh and a was-scepter from the god. Sobekhotep is followed by his father Montuhotep, his mother Iuhetibu, and his wife Senebhenas. Sobekhotep III is known from a high number of objects despite the fact that the Turin King List gives him a reign of only four years and two to four months in length. He added inscriptions to the temple of Menthu at Madamud and built a chapel at El Kab. On Sehel was found an altar with his name. A number of scarab seals have been found that were from an officier of the ruler's table Sobekhotep begotten of the officier of the ruler's table Mentuhotep. It is possible that these seals belonged to Sobekhotep III before he became king. Sobekhotep III was the first of a group of Thirteenth Dynasty kings about whom there exists historical records. This group of Thirteenth Dynasty kings are all known from a large number of objects. These kings produced many seals and there are many private monuments that can be dated to these reigns. This would seem to indicate that Egypt was relatively stable during this period. Neferhotep I was an Egyptian king of the Thirteenth Dynasty and one of the most powerful rulers of this dynasty.The Turin Canon assigned him a reign length of 11 years. Neferhotep I came from a military family. His grandfather, Nehy, held the title 'officer of a town regiment'. Nehy was married to a woman called Senebtysy. Nothing is known about her, other than that she held the common title 'lady of the house'. Their only known son was called Haankhef. He appears in the sources always as 'God's father', and he was married to a woman called Kemi. Haankhef and Kemi were the parents of Neferhotep I. The family of Neferhotep I seems to have come from Thebes. Neferhotep I's brother, king Sobekhotep IV, stated that he was born there, on a stela that was placed during his reign in the temple of Amun at Karnak. However, the main capital in the Thirteenth Dynasty was still Itjtawy in the North, near the modern village of el-Lisht. A woman called Senebsen is known as Neferhotep I's wife. Neferhotep I is known from a relatively high number of objects found across all parts of Egypt and Egyptian-controlled Lower Nubia. In the Turin King List he was given a reign of eleven years, one of the longest of this period. He is also known from a relief found at Byblos. The most important monument of the king is a large, heavily eroded stela dating to year two of the king's reign, found at Abydos. The inscription on the stela is one of the few ancient Egyptian royal texts to record how a king might conceive of and order the making of a sculpture. There are also numerous inscriptions in the Aswan region mentioning Neferhotep I's name, as well as the names of family members and officials serving under this king. It is from these inscriptions that we know the name of his wife (Senebsen) and his son Haankhef and his daughter Kemi. It is not known under which circumstances Neferhotep I died after his reign of eleven years. His successor was his brother, Sobekhotep IV, and who is perhaps the most important ruler of the Thirteenth Dynasty. Another brother, Sihathor, appears in the Turin King List as successor, but there is no real proof that he ever became king. There are several monuments mentioning Neferhotep I and Sobekhotep IV together. This could mean that they may have reigned for some time together. Nevertheless the reigns of these two brothers in the Thirteenth Dynasty mark the peak of this otherwise rather shaky era. There are many private monuments datable under these kings, and especially in sculpture some remarkably high quality art works were produced. Khaneferre Sobekhotep IV was one of the most powerful Egyptian kings of the 13th Dynasty. He was the son of the 'god's father' Haankhef and of the 'king's mother' Kemi. His brother, Neferhotep I, was his predecessor on the throne. He states on a stela found in the Amun temple at Karnak that he was born in Thebes. Some sources indicate that under his reign, a military campaign against Nubia occurred (the Jewish writer Artapanus mentions a king Chenephres (Khaneferre) under whom the Moses story took place and who invaded Nubia). The king is believed to have reigned for around 10 years. He is known by a relatively high number of monuments, including stelae, statues, many seals and other minor objects. There are attestations for building works at Abydos and Karnak. Sobekhotep IV's wife was the 'king's wife' Tjan. Several children are known. The royal court is also well known. Vizier was Neferkare Iymeru. Treasurer was Senebi and high steward a certain Nebankh. According to the New Chronology proposed by David Rohl, Khaneferre Sobekhotep IV was the Khenophres mentioned by Artapanus, under whose reign Egypt suffered plagues and the increase of 'foreigners. According to this revision, this would have been the Pharaoh who raised Moses as a prince of Egypt. Sobekhotep V was an Egyptian king of the 13th Dynasty. His birth name was Sobekhotep, and his throne name was Merhotepre Sobekhotep V appears in the Turin King List as the successor of Sobekhotep IV. According to this document, he only reigned for four years. Sobekhotep IV was perhaps his father, as he had a son called 'Sobekhotep'. Sobekhotep V is known from a statue found at Kerma and from several scarab seals. Sobekhotep VI was an Egyptian king of the 13th Dynasty. His birth name was Sobekhotep, and his throne name was Khahotepre. Wahibre Ibiau (throne name: Wahibre - birth name: Ibiau) was an Egyptian king of the 13th Dynasty, who reigned for 10 years, 8 months and 29 days according to the Turin King List. He is not known from many contemporary monuments. There are several scarab seals with his name as well as a stela of an official of his and some other minor objects. Merneferre Ay (also spelled Aya or Eje) was an Ancient Egyptian ruler of the Thirteenth dynasty of Egypt. He assumed the throne around 1700 BC. His reign length-as preserved in the damaged Turin King List - was disputed in the past with Jurgen von Beckerath reading the damaged figure on the papyrus fragment as only 13 years in his 1964 work Untersuchungen zur politischen Geschichte der zweiten Zwischenzeit in Agypten, while both Alan Gardiner - in The Royal Canon of Turin (1959)--and Kenneth Kitchen in his 1987 paper 'The Basics of Egyptian Chronology in Relation to the Bronze Age at the "High, Middle or Low" University of Goteborg convention maintained that it was 23 Years. The latest examination of the damaged figure by Kim Ryholt confirms that it must be read as 23 Years. Ryholt stresses in his 1997 book on the Second Intermediate Period that "the tick that distinguishes 20 and 30 from 10 is preserved and beyond dispute. Accordingly, 23 years or, less likely, 33 years must be read." Therefore, Ay's reign length was 23 Years, 8 Months and 18 days This makes him the longest ruling Pharaoh of the 13th Dynasty - at a time when numerous short-lived kings ruled Egypt. Merneferre Ay is mainly known from his many scarab seals. However, the pyramidion of his tomb - which is inscribed with his name - was discovered at Avaris which suggests that the Hyksos kings looted his pyramid tomb of its treasures. This can be assumed because the pyramidion was inscribed with dedications to the god Ptah whose cult was based at Memphis, not Avaris. He is the last significant Egyptian king of the 13th Dynasty known from objects found in Lower and Upper Egypt which indicates that Egypt was still united during his reign. He was possibly married to Ineni. He is sometimes confused with Ay, a ruler at the end of the 18th Dynasty. However, both kings ruled in completely different dynasties and have nothing in common other than a similar name. 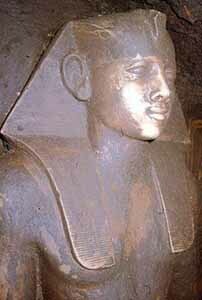 Merhotepre Ini was the son and successor of Merneferre Ay and a king of the late Thirteenth dynasty of Egypt. He is assigned a brief reign of 2 Years 3 or 4 Months and 9 days in the Turin Canon. Although Merhotepre enjoyed a very brief reign, he is attested in the historical records by the Cairo Juridical Stela. This document, which is dated to Year 1 of the later Theban king Nebiryraw I, contains a genealogical charter which states that Ayameru--the son by Vizier Aya and the King's daughter Reditenes - was appointed Governor of El-Kab in Year 1 of Merhotepre Ini. The reason for this appointment was due to the unexpected death of the childless Governor of El-Kab Aya-junior who was Vizier Aya's eldest son and Ayameru's elder brother. The charter identifies a certain Kebsi as the son of Governor, and later, Vizier Ayameru. The Cairo Juridical Stela records the sale of the office of the governorship of El-Kab to a certain Sobeknakht. This Sobeknakht was the father of the illustrious governor Sobeknakht II who built one of the most richly decorated tombs at El-Kab during the Second Intermediate Period.